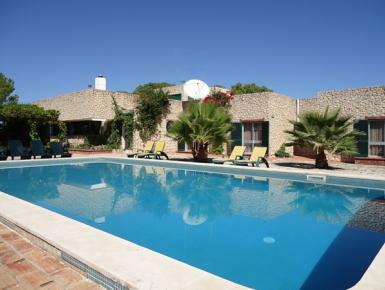 Luxurious 5 bedroomed detached villa, set in large private gardens in a prime location overlooking the town of Silves, with spectacular distant views of Portimão and Monchique mountain. Large secluded pool, outside kitchen with elegant dining area for al-fresco dining. Fantastic games room with full size snooker table and multi-gym. The perfect holiday home for a relaxing holiday with family or friends. This beautiful holiday villa is located in a tranquil location on a private hillside, just minutes away from the beautiful ancient town of Silves and offers a unique sense of luxury, built to a grand and elaborate scale. The house is approached by a sweeping tree lined driveway, with a beautiful stone fountain under the trees. Inside the elegance continues, each room is decorated to a different style giving the feeling of a small boutique hotel.